I recently read that technology isn't to blame for major industry disruption, but poor customer service is the real catalyst. And frankly, there's a lot of truth to that statement. Customers, especially those now growing up asking Alexa whatever question comes to mind, constantly demand a more personalized experience. Give the people what they want, and they will keep coming back for. It's a pretty simple concept, but when ecommerce moves at the speed of technology, it is easier said than done. In order to meet and exceed customer expectations, the world of personalization services and strategies was born. The formula is simple, find a way to connect with the new or returning visitors, serve them up relevant content or product recommendations, and they'll be more likely to engage with your brand. Simple right? If it was, every retailer would be doing it right now. Spoiler alert, they aren't. So what gives -- are retailers dropping the ball when it comes to ecommerce personalization or are shoppers simply demanding too much from the shopping experience? Before we can answer that question, let's get to the root of ecommerce personalization technologies and what it means for your brand. Ecommerce personalization is a practice that is increasingly being used by online retailers to create personal shopping experiences by dynamically displaying content, media or product recommendations based on known or identifiable behaviors. This can include past buying history, browser behavior, demographics, and psychographics. While services focused on personalization and user customization are a hot commodity, they appear to be in the early adopter phase. According to Econsultancy's Digital Trends 2018 report, it cited only 7 percent of an organization's priority is centered on this selling strategy. However, customers want brands to engage with them in a more meaningful. In fact, 22 percent of surveyed shoppers reported being satisfied with the current level of personalization they receive. To start, ecommerce personalization is the number one inquiry into major analyst firms like Gartner. Moreover, personalization strategies can reduce acquisition costs by as much as 50 percent and lift revenue by as much as 5 to 15 percent. For retailers, ecommerce personalization should not only be top of mind, but if it's not already, a common practice in order to stay competitive. A well-developed and well-executed personalization strategy could positively influence everything from increased conversions to improved engagement with your brand to driving long-term customer loyalty. As a modern commerce platform, Workarea joined forces with Dynamic Yield, a powerful personalization platform to uncover the latest use cases on how to implement a personalization strategy. From using simple tactics to get your started up to complex instances that combine real-time data with past user experiences, the webinar reveals success stories from real client examples. 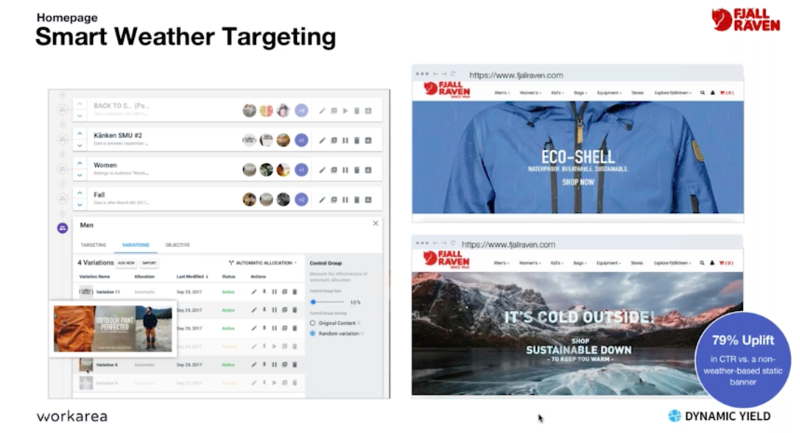 You can download the full webinar here, but to get you started, here are three examples of ecommerce personalization strategies hard at work. Let's face it, one of the easiest conversation starters is the weather. It's also a personalization tactic proven to drive sales. In this example, the popular outdoor apparel site, Fjallraven, changes its homepage dynamically in real-time to reflect the weather in your order. Combine this straight-forward best practice with location-based tracking and retailers can serve up product recommendations to meet the needs of new and existing customers from Hawaii to Maine without having to lift a finger. While weather and location-based targeting are great for new visitors, it's best to use past buying and browsing behaviors when creating ecommerce personalization strategies for returning guests. By swapping out weather widgets with stronger call-to-actions based on past experiences, you're far more likely to increase conversion rates by relating to user preferences. Even with the emphasis on mobile responsiveness, the world of ecommerce trends and product merchandising moves quickly. Sometimes too quickly for busy ecommerce teams to create custom imagery for each device type. 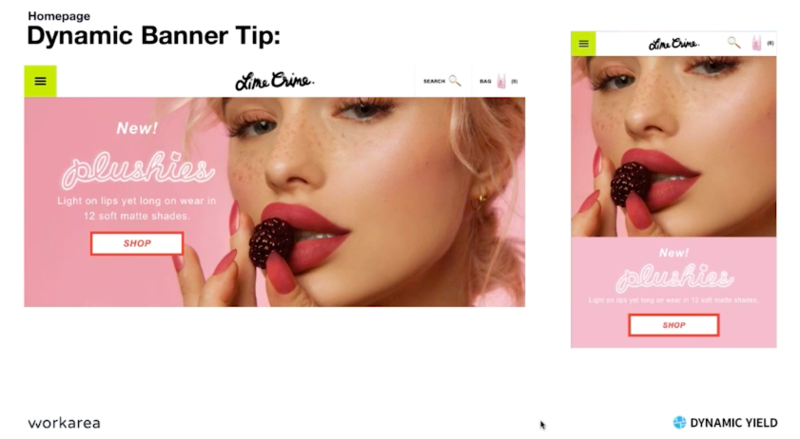 In this example, vegan makeup brand, Lime Crime designs and dishes up custom imagery based on the user's device type. Admittedly, this Workarea client has a leg up on the competition as mobile responsiveness and customizations are standard on the platform. However for ecommerce teams that do not have this luxury, creating banners for specific to different device views is critical to readability, clarity of what you are promoting and tap-ability of clicking and more importantly, converting on your coveted offer.